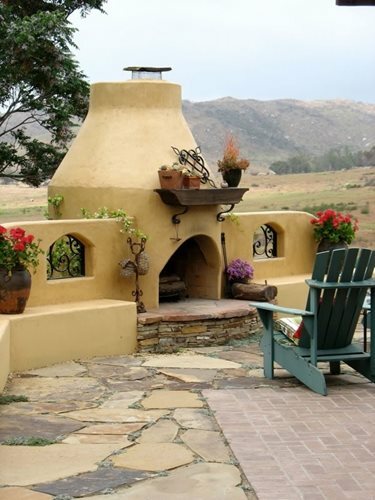 Shop Outdoor FireplacesFind the perfect fireplace for your backyard or patio. From pre-built modular units to custom or precast, there are a variety of options for finding a fireplace that suits your needs. 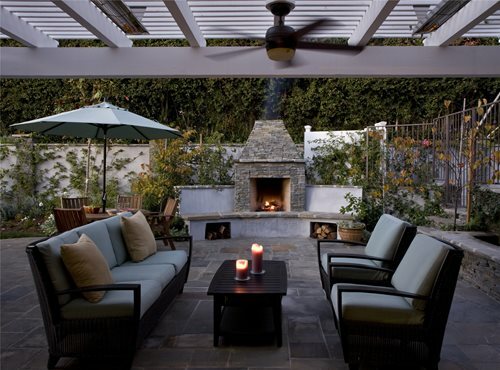 Installed for their warmth as well as their ambiance, outdoor fireplaces transform backyards into cozy outdoor living rooms where people can gather and relax even when there's a chill in the air. 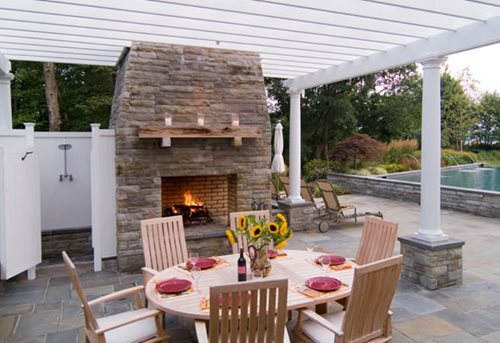 For the patio, fireplaces often become a design anchor and tend to be where furniture and other elements of the outdoor living space are centered. 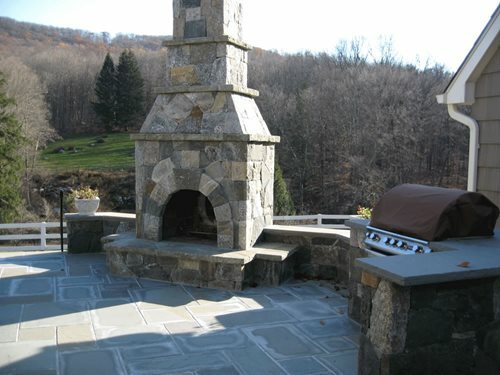 Outdoor fireplaces come in a variety of styles and finishes. Choosing the right fireplace for your outdoor room can be overwhelming, considering all of the options in design, size and type. It will become easier to narrow down which fireplace is right for your space after you learn more about the various features of each type. Keep in mind that the fireplace material you choose needs to resist exposure to the weather and withstand extremely high temperatures. It is also beneficial to select a fireplace facing that is easy to clean, so soot and ashes can simply be hosed off. The most popular fireplace styles (Southwestern, Mediterranean, modern and traditional) and the design characteristics of each. Choosing the best location for your outdoor fireplace, considering such factors as space availability, local building codes, privacy and wind direction. How zoning regulations can dictate the location and chimney height of your fireplace. Choosing the best size for your outdoor fireplace based on the scale of your yard, your entertaining needs, and the amount of heating you want to provide. 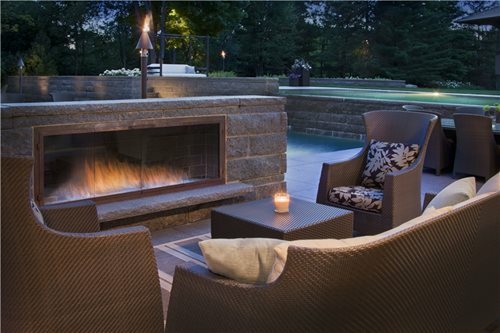 Seating options for enjoying an outdoor fireplace, including movable patio furniture and permanent built-in seating. Various options for outdoor fireplaces, including mantels, hearths, lighting, and built-in wood storage. The differences between a firepit and a fireplace and how to choose the best outdoor fire feature for your needs. 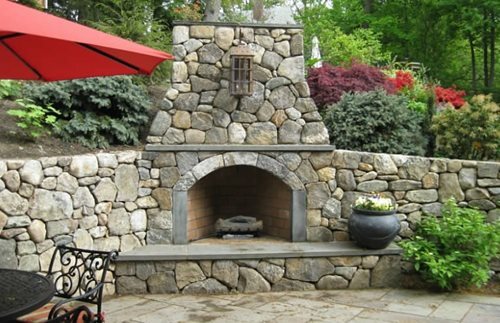 The pros and cons of the most popular outdoor fireplace facing materials, including brick veneer, stone, stucco and decorative concrete. 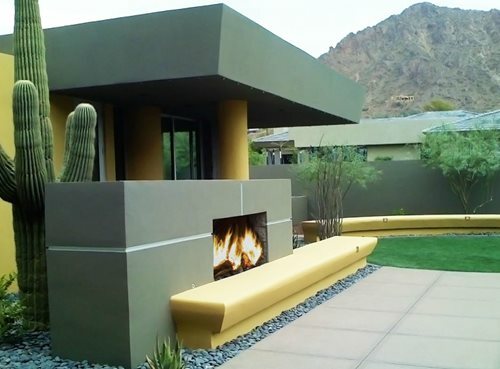 The design options and cost ranges for custom-built outdoor fireplaces. Information about fireplace kits, including cost ranges, types and resources. Resources and cost ranges for prefab outdoor gas fireplaces, which are delivered to your home in a finished state and simply require you to hook up the fuel line. The three main structural components of an outdoor fireplace and the basic design and construction requirements for each. The main factors to consider when choosing a base for your outdoor fireplace, including your soil type, freeze-thaw conditions and the weight of the fireplace. 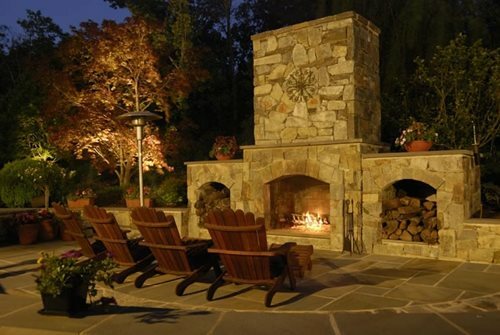 The pros and cons of wood burning vs. gas-fueled outdoor fireplaces. 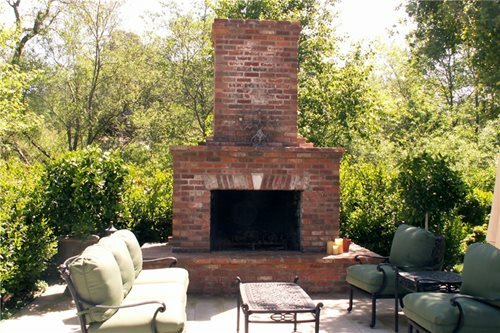 Typical chimney and vent requirements for wood-burning outdoor fireplaces. Because of safety issues, outdoor fireplaces should be installed by a professional and built according to your local building regulations.